While in Seattle a couple of weeks ago visiting our son and precious daughter-in-law (who are expecting our 1st girl grandchild! ), Debra and I took in the Chihuly Exhibit at Seattle Center, right at the base of the Space Needle. 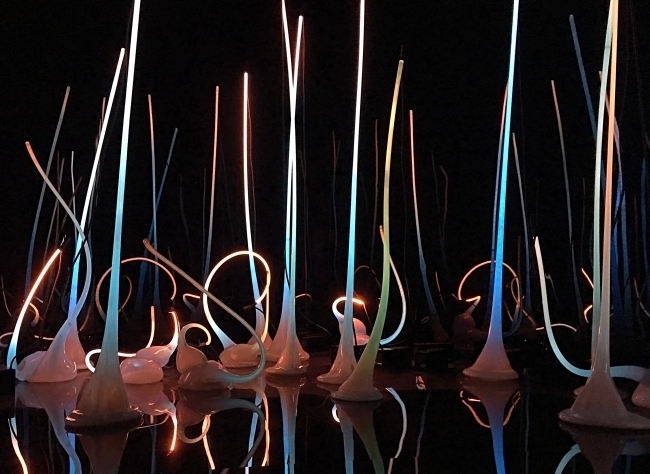 If you’re not familiar with Dale Chihuly, you can find him all over the Internet – and installations of his work all over the world. Chihuly’s work with glass remains his forte (in my opinion). The Seattle exhibit is a melee of colors and shapes – a fantastic surreal fantasy, at once familiar and alien. This post is about the pictures, so I’ll be kind of quiet. I’ve not included our customary watermark on these shots; I couldn’t figure out how to do that without insulting the images. I trust that if somebody wants to use one, they’ll give appropriate attribution.